THE WRITING BUDDHA - Opinions | Books | Movies: 19th Akshauhini by Haribakth/Vaishnavi (Book Review-3.75*/5) !!! 19th Akshauhini by Haribakth/Vaishnavi (Book Review-3.75*/5) !!! These days many writers are publishing books based on Gita or their own version of Gita. It is good to see such books doing good in Bestseller's List because this generation needs to know about the Indian mythology and there is no better way than reading such books which are written in simple and friendly language. 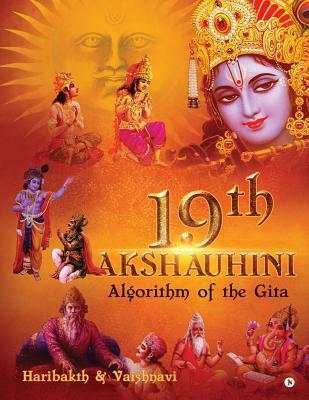 The latest book that I have read based on Gita is "19th Akshauhini" which the author calls it as an explanation of algorithm of the Gita. The book is written by the father-daughter duo- Haribakth and Vaishnavi. The author have tried to answer many questions that he feels people want to know. The book is divided into three parts- The spiritual part, the mundane part and the last one is the pictorial presentation of dialogues through which a reader can easily understand the concepts. Author have tried to explain how Gita is relevant in today's world even after 5300 years. Many examples and situations are discussed through which Gita's credibility has been proved. Many myths have been busted by the author through explanation of difficult terms and breaking them down for a layman to understand how certain rules have been created. Author have also widely tried to prove how God have not been wrong in cases where we easily get off by giving the example of that one mistake committed by God. There are many perspectives of a scenario being discussed and also how there are alternatives to the primary one is told to the readers. I, personally, found the first and the last part of the book very reader-friendly and interesting. The middle section of the book becomes little boring. Also, I didn't find few topics relevant to be included in this book. The research behind writing this book is clearly visible in the way author have given the references and practical examples. I also liked the tabular representation in between of the chapters where the questions and their respective answers are shared with the readers. There are many questions that will get answered for you through this book so it's definitely one of the good books based on Gita and explanation of how it can be followed in our modern world. I have little complaint with the publisher for publishing this book in such a large size. It has made it so heavy that reader will find it hard to carry with him while traveling or reading while lying on the bed. Also, the price of the book is on the higher side. This might act as a blockage for this book towards its journey of becoming a Bestseller. I give this book 3.75* out of 5.